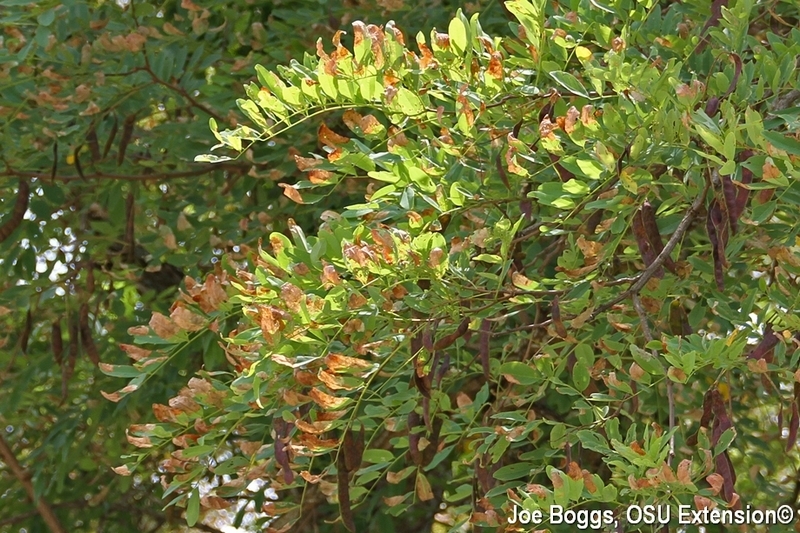 This past Friday, I observed heavy damage on black locust caused by the locust leafminer beetle (Odontota dorsalis) along State Rt. 50 in Ross and Vinton Counties. The captivating reddish-brown leaf coloration caused by this beetle is often a familiar sight to travelers motoring on Ohio's interstate highways. Indeed, black locust may be identified at highway speeds because they are the "flamed" trees in the tree lines bordering the highway. The damage is caused both by the larvae which feed as leafminers and the adults which feed as skeletonizers. Usually, the adult feeding damage is most apparent which is why the browning of black locusts is most apparent later in the season. However, the damage I saw was mostly caused by larval leafmining activity which may predict heavy summer damage caused by the adults that will emerge from the blotch-like leaf mines.